VIRGINIA’S NEW RIVER VALLEY — Virginia’s First Regional Industrial Facility Authority (VFRIFA) recently released a new video for the New River Valley Commerce Park. The 1,000-acre park is development ready and strategically located in Virginia for easy shipping and distribution on the East Coast. Immediately adjacent to the New River Valley Airport and 3.5 miles from Interstate 81, New River Valley Commerce Park makes this an ideal property for industrial development. The site is certified by McCallum Sweeney as an AEP Quality Site-Large Park. It is also considered a Tier 4 site by VEDP’s Virginia Business Ready Sites Program. The video is also available on the VFRIFA YouTube page. For more information, visit www.nrvcommercepark.com. 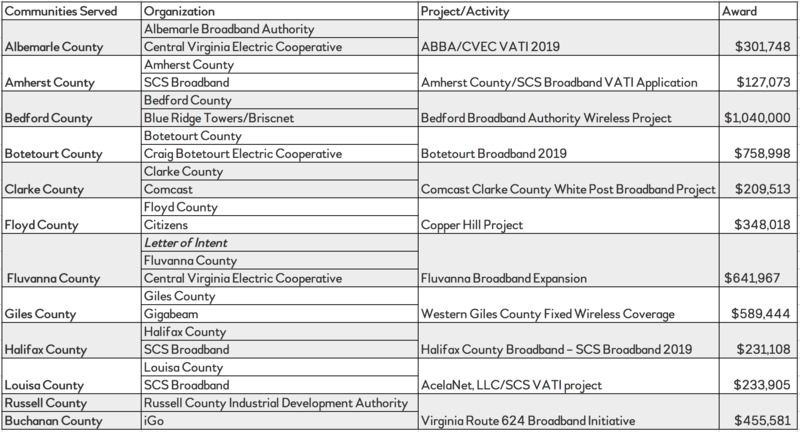 VIRGINIA’S NEW RIVER VALLEY – Both Floyd and Giles counties received Virginia Telecommunication Initiative Grants, which Governor Northam announced on Friday, March 29. Floyd County and Citizens received $348,018 for their Copper Hill project. Giles County and Gigabeam received $589,444 for their Western Giles County Fixed Wireless Coverage project. This funding will help extend broadband service to underserved areas. More than 15,000 homes, 300 businesses, and community anchors to gain broadband service. RICHMOND, VA — Governor Ralph Northam announced over $4.9 million in grants through the Virginia Telecommunication Initiative (VATI) for 11 projects within 12 counties throughout Virginia. The VATI program provides targeted funding to extend service to areas that are presently unserved by any broadband provider. Read more about 1901 Group, their presence in Virginia’s New River Valley, and their plans for the future from Tim Thornton at Virginia Business. The Japan Times recently mentioned the New River Valley Commerce Park in Dublin, VA.
Pulaski County is home to many international manufacturers, and the New River Valley Commerce park is ready to help locate even more. The Japan Times noted that Virginia is eager for Japanese partnerships. View or download information about the New River Valley Commerce Park. PULASKI COUNTY, VA – WSLS Channel 10 reports that Pulaski County’s new $100 million housing development plans to bring homes for 1,200 residents. It is the largest planning and development project in county history. The new development is planned for behind the new Pulaski County Middle School, which is now under construction. Utilities are being put in place now and then whole project could take up to ten years to be fully complete. VIRGINIA’S NEW RIVER VALLEY – Several assets and locations in Virginia’s New River Valley have made the cut as some of the best of Virginia’s Aerospace industry. The accolades were published in the Fall 2018 Edition (current issue) of the Southern Business & Development Magazine. The best places in Western Virginia for Aerospace included Montgomery County-Blacksburg and Radford. 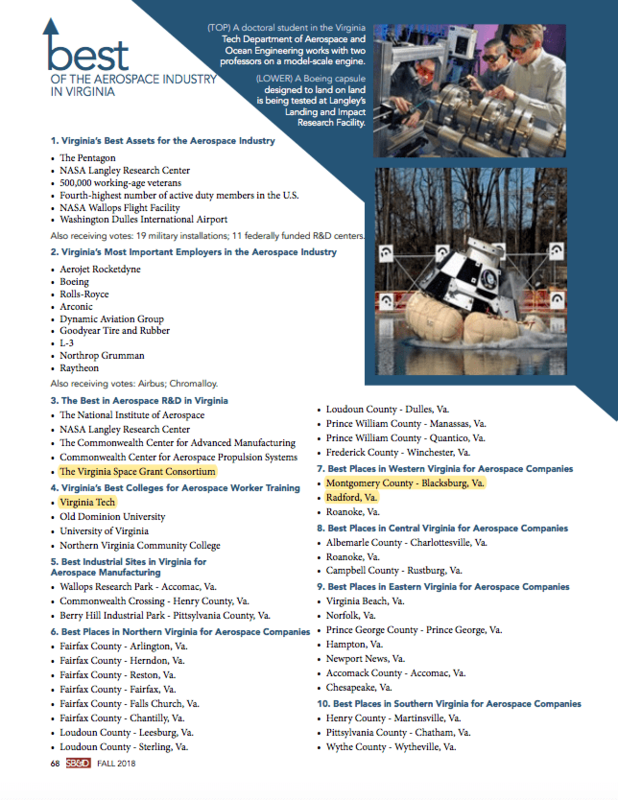 Virginia Tech was also named one of the Best Colleges for Aerospace Worker Training. The Virginia Tech Aerospace and Ocean Engineering is the #5 program in the world according to the center for World University Rankings (2018). The Virginia Space Grant Consortium, which Virginia Tech is a part of, was also mentioned as one of the best in Aerospace R&D in Virginia. Click to enlarge the photo on the right to view all rankings in Virginia. 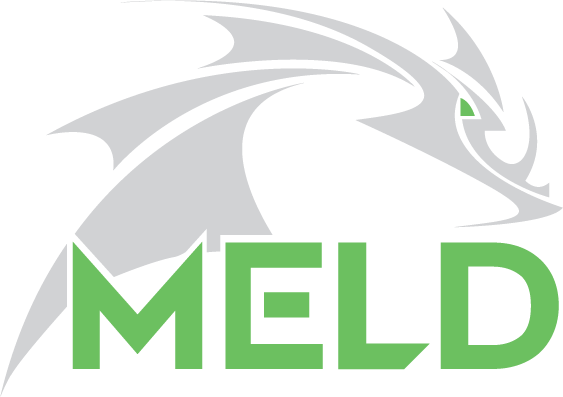 CHRISTIANSBURG, VA – MELD Manufacturing Corporation has launched a new training program that will give participants certification in operating MELD machinery. The 4-day courses will be hosted at MELD’s headquarters in Christiansburg, VA and attendees will receive both hands-on machine training and classroom instruction led by experts in the technology. MELD Manufacturing Corporation’s patented and award-winning technology is a unique no-melt process for the additive manufacturing, repairing, coating, and joining of metals and metal matrix composites. The training course will review the history of how MELD was developed and provide participants with a deeper understanding of its material compatibility, application capabilities, and other properties. Participants will also be instructed on identifying required machine settings for the wide range of metals compatible with the technology and be taken through each step of the MELD process, from digital print file creation to deposition. Class sizes will be very limited to ensure the maximum amount of hands-on machine time for each attendee. At the end of the sessions, participants will receive a certificate demonstrating their ability to operate MELD machinery. Visit http://meldmanufacturing.com/meld-operator-training/ for class details and registration for remaining openings. MELD Manufacturing Corporation holds more than a dozen patents for MELD™ technology, an innovative process for additive manufacturing, coating, joining, and repairing metals and metal matrix composites. MELD™ offers the power to build parts in solid state, thereby avoiding the issues associated with melting. The technology is also open-atmosphere, meaning no special vacuums or chambers are needed for operation. The MELD™ equipment is scalable and can produce parts much larger than similar processes. MELD Manufacturing Corporation offers MELD machines sales, contract manufacturing, and consulting services. Learn more at www.meldmanufacturing.com.